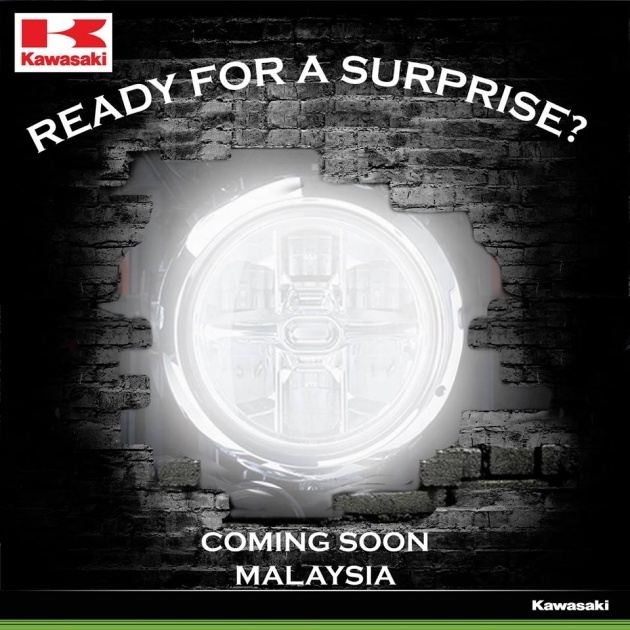 A teaser image on Kawasaki Motors Malaysia’s Facebook page has appeared, showing a headlight and the tagline, “Ready for a surprise? Coming soon to Malaysia.” Although few details are discernible from the photo, we assume that this signals the impending launch of the 2018 Kawasaki Z900RS retro-naked sports bike in Malaysia. First shown at the Tokyo Motor Show in October and subsequently at the EICMA show in Milan, the Z900RS carries classic motorcycle bodywork from the seventies, overlaying modern running gear. The Z900RS is derived from the current model Z900 naked sports bike. Carrying the same 948 cc, four-cylinder power plant as the Z900, the mill in the RS is tuned to give less top-end power with 111 hp at 8,500 rpm but more mid-range torque at 98.5Nm at 6,500 rpm. The frame has been redesigned to accommodate the humped fuel tank as well as the retro-styled bodywork. New for the Z900RS is radially-mounted four-piston brake callipers, clamping 300 mm discs in front while the rear gets a dual-piston calliper and single 250 mm disc, with ABS and two-mode traction control. Rolling on 17-inch wheels, the Z900RS weighs in at 215 kg and carries fuel in a 17-litre tank. The current model Kawasaki Z900 is priced at RM49,158 for the base version, while the Z900 SE goes for RM50,959, with all prices including GST. When the 2018 Kawasaki Z900RS is released next year, it is likely to be priced a little above the Z900, probably close to the RM58,000 Kawasaki asked for when it launched the W800 retro bike a few years ago, provided it comes in as a CKD unit. Retro bike without retro prices. A bike like this cost just few thousand ringgit in retro times. Well, if this retro bike’s too exp for u mate, then theres this https://paultan.org/2017/10/17/2018-keeway-k-light-202-retro-cafe-racer-152-and-patagonian-eagle-250-in-malaysia-from-rm6152/. Oh yeah! Retro bike at retro prices! Who says RM got no value, huh? They just dont know how how to find value in their money. Pity their poor financial management skills. Less top end power but have to pay more for retro look. A case of customer has to work harder in 2018. Smart kawa. If Kawasaki seriously wanted the retro styling in the streets they had it with the W800… but big bikes are useless in the city. Kawasaki should have brought in the W series 175cc and 250cc Estrella… great for commuting with the retro styling. really want to see the Z900RS in person, such an attractive bike. Finally a worthy w800 replacement with proper performance too. How about making a Z125RS or Z300RS or Z650RS for those who can afford it?? Why not?? Since that there is still a fan for that style? ?